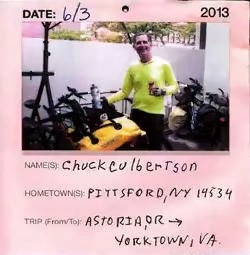 The Adventure Cycling Association is America's premiere bicycle travel experts. Their cycling route network encompasses over 40,000 miles of mapped routes throughout North America. In addition to researching and creating these maps, the ACA also works with state and federal agencies to promote bicycle touring, organizes their own bike tours, and is involved is countless other advocacy projects. Curious about how to get started on your own bicycle tour? Whether you have ambitions of riding to Missoula or just a couple of days around Ohio, our FREE Bicycle Touring class is an introduction to the nuts and bolts of self-supported bike touring. Century Cycles' experienced experts will discuss how to select your bike and other gear, how to select a route, eating, training, and more! This Thursday, January 16 at 6:30pm in Peninsula and Rocky River. Call us to RSVP. See www.centurycycles.com/for/SchoolOfBike for the complete schedule of our School Of Bike classes!